If you are interested in classic sports cars in any way the name of Peninsula Sports Cars will be familiar to you. 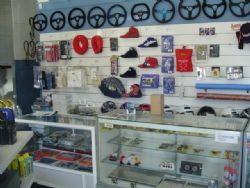 Located in Brookvale, a northern beaches suburb of Sydney Geoff Morse and his team specialise in British cars. Geoff has been in the business for over 30 years having started in a service station when just 21. Then in 1990 an opportunity came along that he couldn’t resist - buying the Morris Minor Centre. Geoff looked after Sydney’s Morries for 10 years before selling the business to Morris Minor World. However while at the helm of the Morris Minor Centre Geoff found his name spreading amongst the British car fraternity with MG and Sprite owners seeking him out for work on their cars. Seeing an opportunity Geoff set up Peninsular Sports Cars in 1998 and while the leaning is distinctly MG he is proud to say that his staff are capable and qualified to take on any British car. The work undertaken by Peninsular Sports Cars is roughly divided into two – servicing/repairs and sales with the four staff members similarly divided. 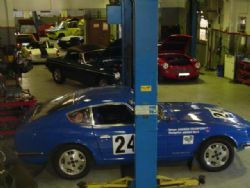 The workshop staff are highly experienced in the maintenance of British cars and of course MGs in particular having ran their own workshops, race prepared vehicles, engine rebuilding/modification and gearbox rebuilding including Laycock deNormanville overdrives. In the sales office Geoff is firmly at the helm looking after spares and race gear. As you would expect the spares are MG orientated, predominantly for the MGB but there is also a brisk trade in parts for MGAs and Midgets. Mention “Special Tuning” to a true MG enthusiast and you will no doubt hear a distinct sigh. Well! Geoff has sourced or has made all those “Special Tuning” engine, exhaust, suspension, carburetors, and manifold parts that are made just for MGs. 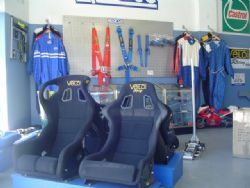 Peninsula Sports Cars is also an outlet for the range of Revolution Racegear, Sparco products and the NSW agent for Velo seats. For enthusiasts who don’t have the time or desire to be hands-on with their classic car Geoff and his team can undertake anything from a simple service to a complete restoration. They are also an Authorised Inspection Station when its rego time. As we have mentioned it’s not just MGs either, as they are quite happy and capable to take on anything that needs their tender care. In the last couple of years such British thoroughbreds as Daimler, Riley, Austin-Healey, Sunbeam and Triumph have received attention. Talking about MGBs, Peninsula Sports Cars can restore your car as Abingdon intended or right through to full race. Popular amongst B owners is the Stage 2 conversion that includes porting and polishing the cylinder head, balancing the engine and the fitting of a special camshaft along with extractors and a dual throat Weber carburetor. This increases the output to 85 – 90 bhp at the rear wheels – just perfect for club sprints, regularity events or fast road touring. 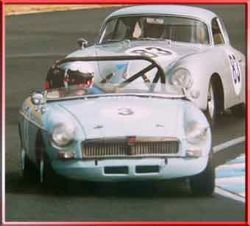 If you want to go further Geoff has his own full race and highly successful Historic Racing MGB to show you just what can be achieved. A complete restoration? Not a problem as Geoff’s team can manage it from the time your sore and sorry car arrives to when you drive out as a proud owner. Everything is done in-house except for paint, panel and upholstery which is sent out to trusted tradesmen. You would think everyone at Peninsula Sports Cars would be busy enough with so many British cars to look after? That’s certainly the case but Geoff is now looking further afield and appreciates that the owners of the world’s largest selling sports car, the Mazda MX5 could also benefit from his assistance, after all the oldest MX5 is now 18 years old. So if your MG or British car needs attention or perhaps you are after spares give Geoff Morse at Peninsula Sports Cars a call.